When you’re considering a full roof replacement, deciding which material will be the best fit for your property, your taste, and your budget can be overwhelming. A new roof is a relatively large investment, and you want to be confident that you’re choosing something that will enhance your property and be as durable as you need it to be. If you’ve been in the market for a new roof for your home or business, you can count on the experienced professionals at L & L Contractors to help you choose the perfect roofing material for you and your needs. We work with a number of different manufacturers, and though we stand behind the product quality and warranties provided by each, we have no loyalty to any manufacturer in particular. Instead, our loyalty is to our customers. 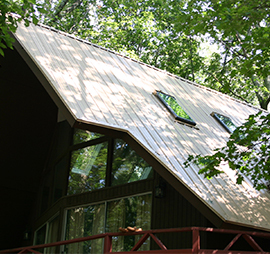 We’re committed to your satisfaction with the quality, performance, durability and appearance of your roof. Asphalt Roofing: Asphalt shingles are the most commonly used roofing materials and for good reason. Asphalt is affordable, acts as a waterproofing agent, is proven to be flexible, and will not dry out or become brittle during its expected lifespan (which is 20 years to a lifetime). L & L Contractors uses CertainTeed asphalt shingles, Atlas Roofing shingles and GAF asphalt shingles, and we can install either strip, dimensional, or premium shingles. And don’t worry – we have many color options for you to choose from! EPDM Rubber Roofing: This roofing material, made of Ethylene Propylene Diene Monomer (EPDM), is something we recommend for low-slope commercial roofing applications. It’s a synthetic rubber compound proven to provide outstanding weatherproofing protection for office buildings, distribution warehouses, hospitals, schools, and more. Read more about EPDM here. TPO® Energy Efficient Roofing Systems: Thermoplastic Polyolefin (TPO) single-ply roofing membranes are quickly becoming one of the most popular commercial roofing products. TPO® is a heat-reflective and energy efficient roofing system known for providing resistance to ultraviolet, ozone, and chemical exposure. Find out more. Metal Roofing: L & L Contractors is one of the top metal roof installers in Middle Tennessee. We install the following types of metal roofing: standing seam, Max-Rib, R-Panel, and 5V. We’re also one of the only Decra installers in Middle Tennessee. Visit our metal roofing page for more info about each type. For more information on the roofing materials we regularly work with, we encourage you to continue to look around our website. If you have any questions or would like to schedule a consultation with one of our skilled roofers, please give us a call at (615) 617-3189. A new roof for your home can increase its street appeal and add value at the same time. Call us for help with all your roofing needs.